First Published: 1857 - It was titled 'One Horse Open Sleigh', and was originally written as a song for Thanksgiving. First Recorded: 1898 on an Edison Cylinder (phonograph), by the Edison Male Quartette. Featured Artist: Jim Reeves from the album 12 Songs Of Christmas. Oh what fun it is to ride___ In a one-horse o-pen sleigh eh! 2/4 Time: This represents 2 quarter-note or crotchet beats per bar. Each bar can be counted as | 1 2 | or | 1& 2& | etc. 95 bpm (♩) - beat sounds on every quarter-note if you are using a metronome or click track. This song is very simple to play although the fast chord changes in the Intro and Instrumental sections may prove a little quick for beginners... you can hold the G chord over the | Ah - Ah | bits if you like, just till you are able to play them in time. | G - Dm | in 2/4 time means you play the G chord for 1 beat and the Dm chord for 1 beat. The hyphen splits the bar in half with equal beat counts between the 2 chords. represents a 'fermata' symbol, commonly known as a pause symbol. At the end of the song, you strum the C chord and hold... let it ring out. These tips relate to the video on this page. If you don't play along with the video, you can play the song in a more 'straight-forward' fashion without all the added bits in the instrumental sections... beginners will also find it a lot easier to play. JIM REEVES chords and lyrics are property and copyright of their owners. 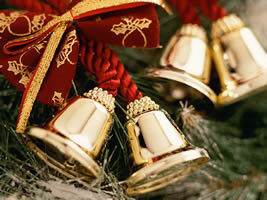 "Jingle Bells" chords and lyrics are provided for educational purposes and personal use only.